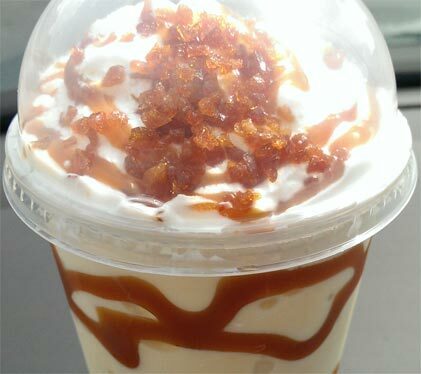 [New for 2014] I had no intention of grabbing this new shake, but my wife asked me to bring her a snack and the call of the pretty treat with the fancy schmancy name was just too much too resist... plus you can't get curly fries without getting a drink! 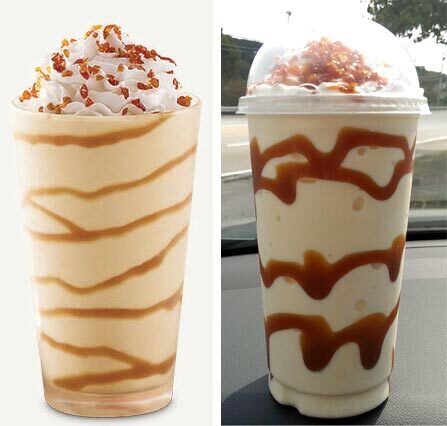 Well, it's certainly a very pretty shake. The side swirls look neat, the dark sugar bits look neat, there's whipcream... what's not to love? I know I can't wait to sip it. First off, this one is mild. I -guess- it tastes like creme brulee, but if anything, it reminds me an awful lot of that Blue Bunny Flan ice cream I had a few months back. I know flan and creme brulee arent the same thing, but the flavors of the treats is definitely similar. I don't love it, but I don't hate this one either. It's just too tame to be offensive. If anything, I wish I had been in the store instead of driving down the road when I tried it. See, right now, the swirls are decorative. It wasn't until we were home that I got a chance to taste them and realized they taste like butterscotch (yes, I know it says caramel swirls, but I taste butterscotch!). Had I been in the store, I could have asked for a spoon and spun everything together and hopefully really brought this treat to life. Plus, I would have been able to spoon off the sugar bits and try them while I was busy mixing everything together. So, where does that leave you? Well, this one kind of lines up with our new motto around here. If this one interests you, don't be afraid to try it. I'm not about to run out and make a special trip just to get this again, but I don't regret my purchase either. If you do try it, be sure to let us know how it went! Good luck! I was hoping they'd go with a Pumpkin shake for fall. How come more mainstream fast food places don't go with a pumpkin shake? There's a chain out west -- Arctic Circle -- which has great pumpkin shakes. All that said, I think I'd like this one, mostly because I find the "plain" old vanilla shake at Arby's deliciouse. Adam, any chance you've had blue bunny's flan ice cream? simply because I thought the two were so similar. Wish I had something else to compare it to now. Nah. I've had the old TH Fried Ice Cream. Not sure if that burtn brown sugar taste is applicable here. Heads up, I'm checking out BR's Pumpkin Cheesecake for TIB. Might be worth your time.